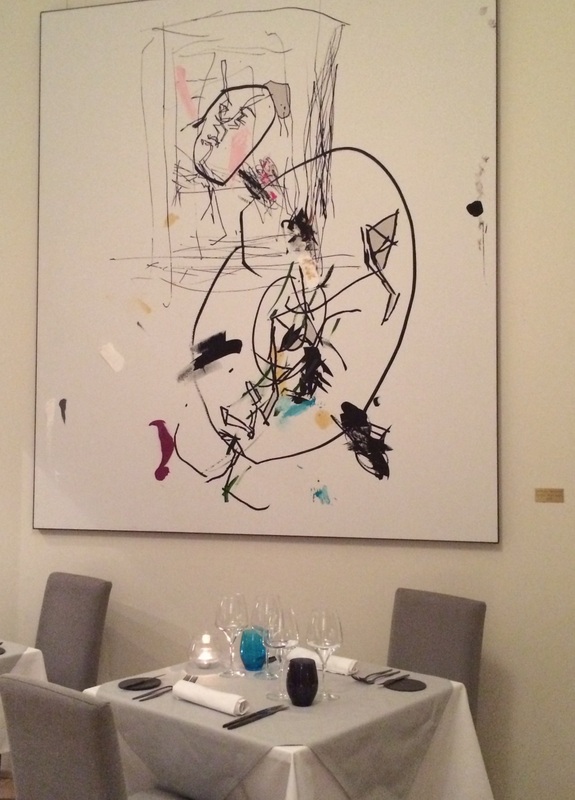 Restaurant Ragu opened its doors April 15, 2014, respecting the history of renovated Neo-Renaissance house in the 1890s. Restaurant has dining rooms and all year-round open terrace, where we dined this time. Chefs Antti Antti Asujamaa and Erno Kemi have created a menu from Italian food traditions and Scandinavian ingredients. Ragu used to have wine bar when we visited first time, but success in restaurant side required more space and bar was partly changed to dining room. Started the dinner with Aperol Spritz and bland de blanc Champagne. Ragu makes the best Spritzs in Helsinki, because the amount of Aperol is just the right, so that you can identify the flavor. You can choose separate portions from a la carte list or pick, for instance, one of the menus. We chose again menu Ludari with 4 courses, which partly are surprises. The name of the menu comes from the street restaurant is located, Ludviginkatu. Kitchen is skilled to take into account customers constraints of some food ingredients and other wishes especially with this menu. Menu should change on weekly basis. 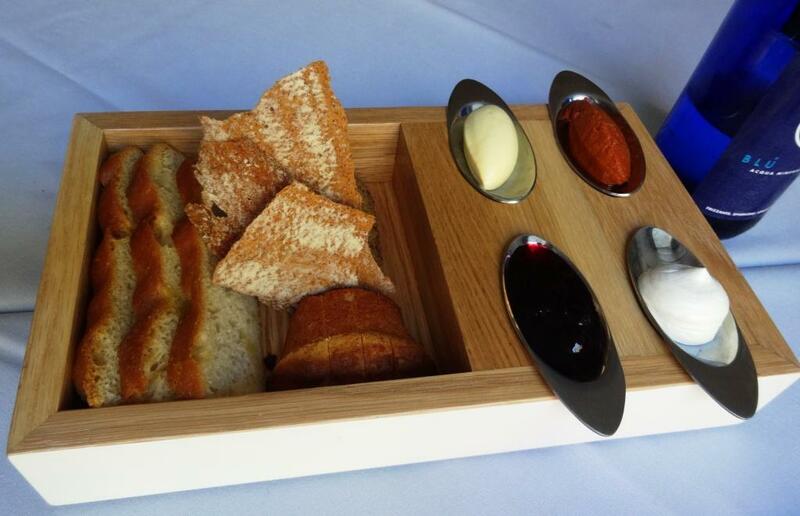 After placing the order freshly baked 4 different breads and 4 different spreads were brought to the table. 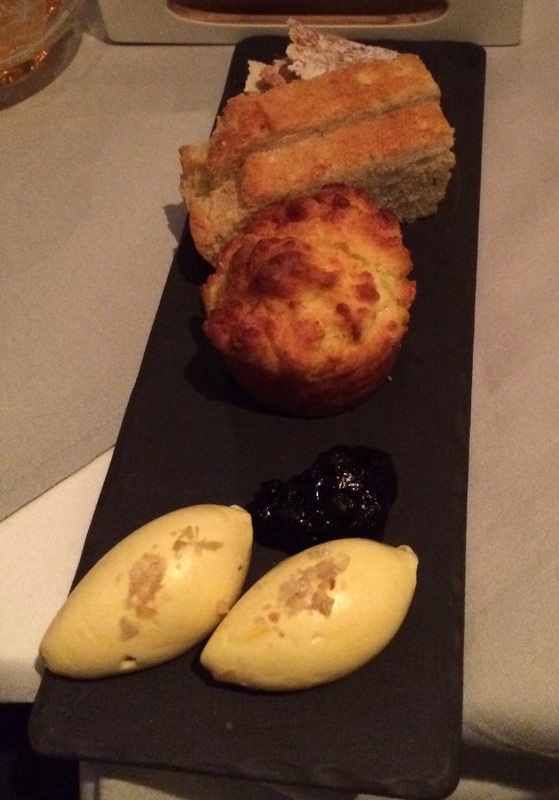 Restaurant also served self made glutein-free bread (in the picture) and must say that the baker really can her job. You can also order home that bread, if you ask it day before. For starters we were served Broiled trout, which was delicious. You really enjoy the taste of fish when it is broiled, but not too much because part of the trout was medium cooked. 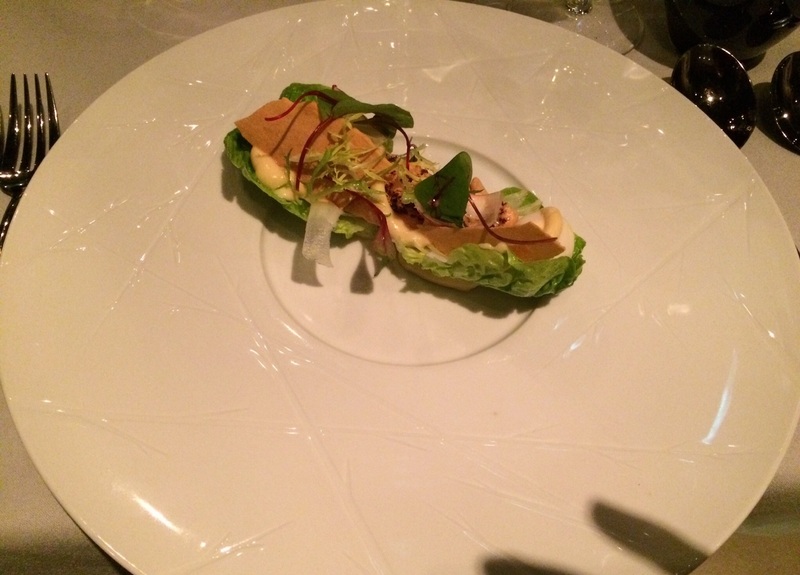 Quail egg and pecorino cheese on salad leaves complemented the enjoyment of eating first course. 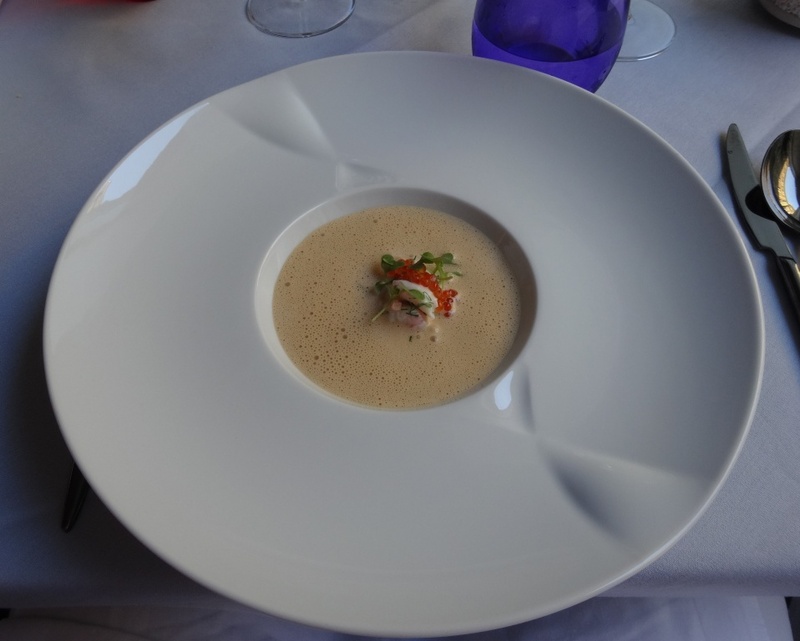 Second course was Crab soup which was served with style. 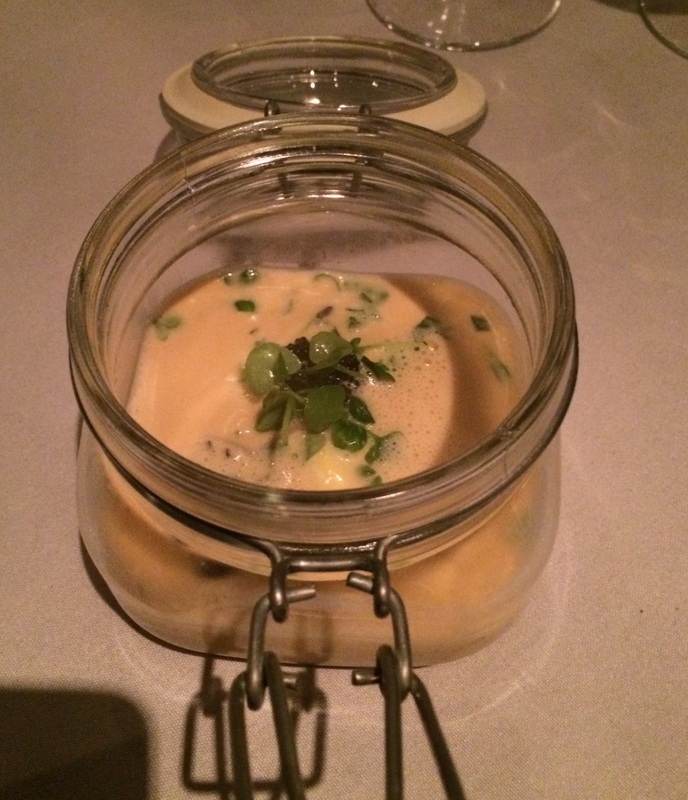 Pieces of crab were in glass jar, which was poured half full with crab stock. 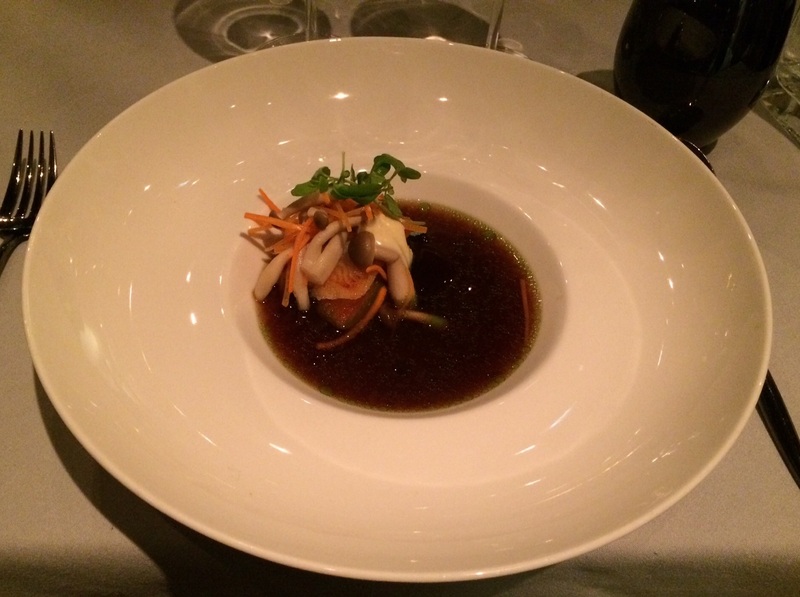 You could also order this dish from a la carte list, which I can warmly recommend. That tasty and mouth-watering crab soup was! For 3rd and main courses restaurant served Braised Iberico pork with risotto and Halibut with dark fish soup. Pork was crisp due to long cooking time. 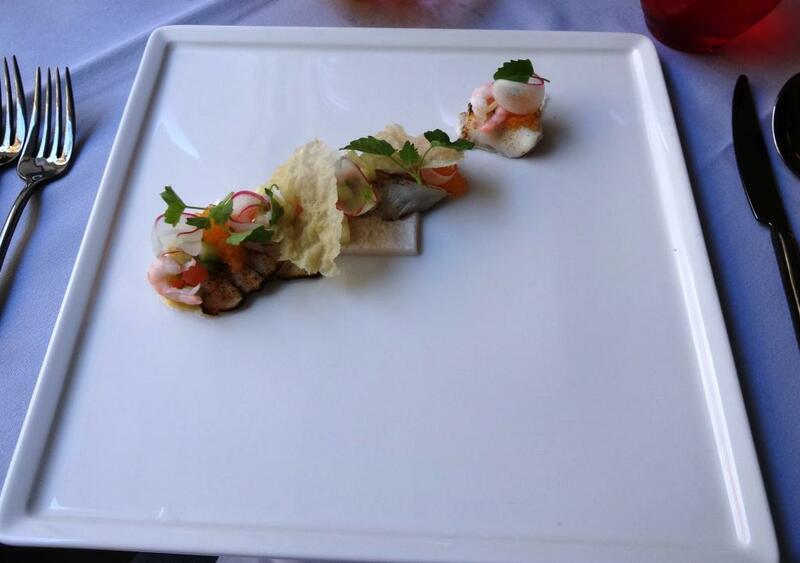 Dish itself was prepared with professional way. Cauliflower lightened otherwise quite luscious dish. Propably halibut was meant to be second dish as it was so small. Also salinity disturbed a little bit. Maybe the weakest link of all dishes. 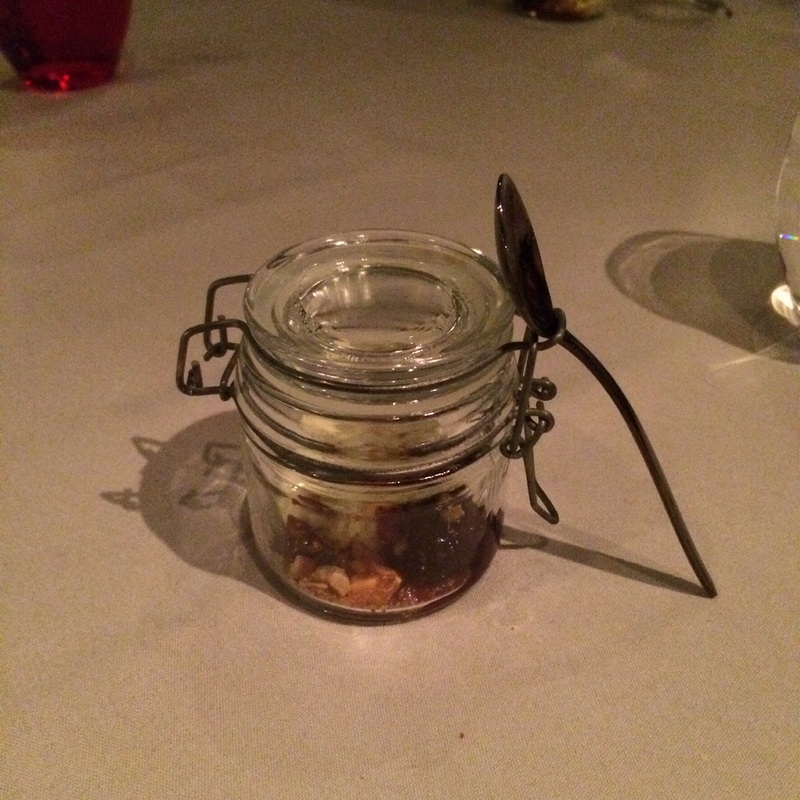 Before dessert restaurant served Blue cheese in a glass jar. 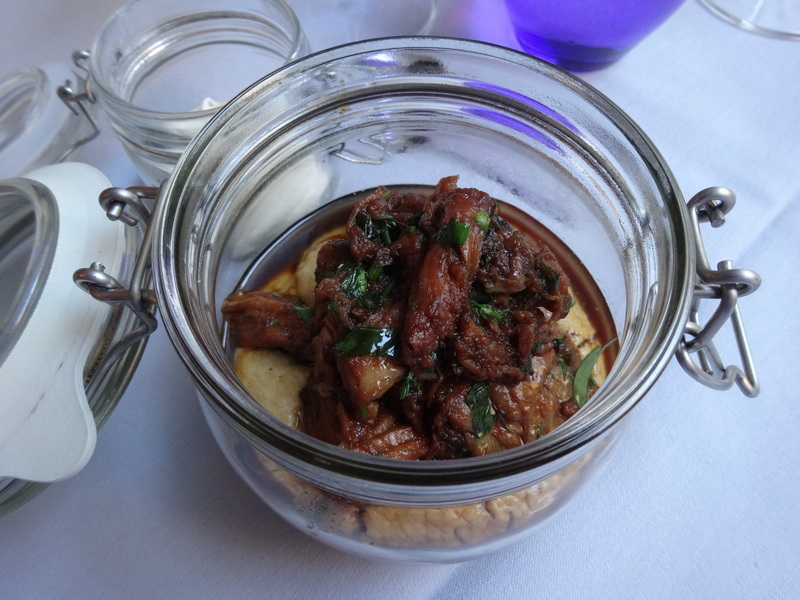 Jars are typical for Ragu as I was served veal similar way when visited first time restaurant. And for desserts we got two different portions due to special requests concerning some of the food ingredients. Pannacotta cake, Ice-cream and other goodies made the dessert like heaven. 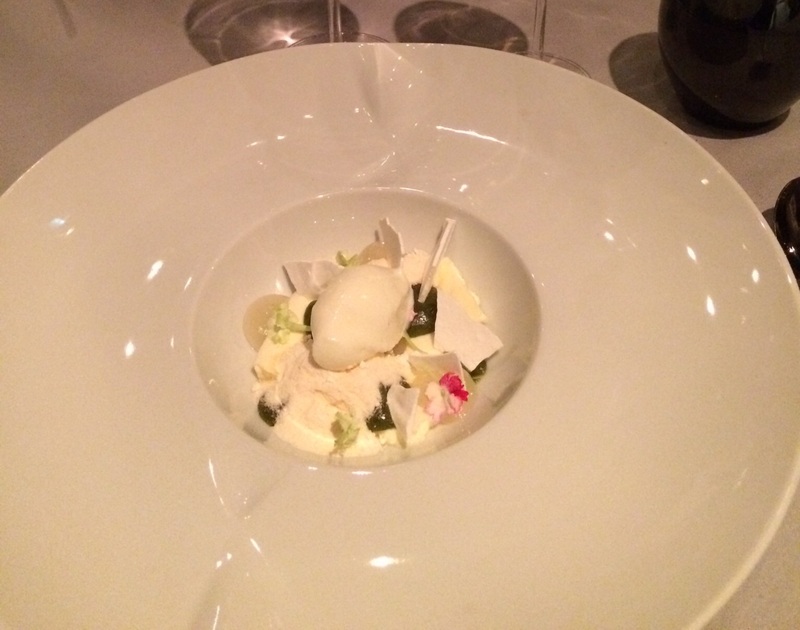 Special dessert was prepared from Meringue and Sorbet, again tour de force from the kitchen. Great way to end the dinner. For wines we trusted restaurant’s recommendations for each portion. All served wines came from Italy, of course. Maybe the best of all 4 different wines was the only red wine with pork. 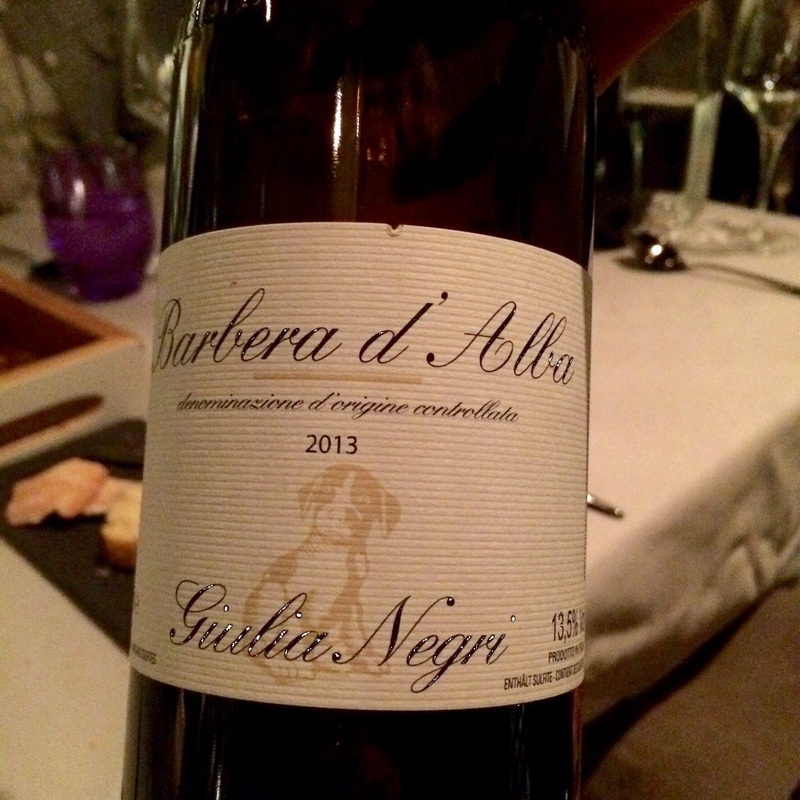 From barbera grapes produced Giulia Negri from Piemonte paired brilliantly with meat. Sweet white wine with dessert was not too sweet and matched with dish nicely. Ragu has also Italian vintage wines from Angelo Baja, Piemonte. So, you can spend almost 500€ for white wine bottle of vintage 1999, if you like to. Restaurant, as it is in elegantly renovated building and it’s dining rooms are classic yet chic, enjoys still of success. You can eat in privacy as tables are not too close to each other. Music is not too loud, again more customer-centric approach. As you can see from the glasses on the tables, every detail has been taken into account. There are many paintings on the walls. We were sitting at the covered terrace where picture below was taken. Remember seeing at least 6 art works in that space. 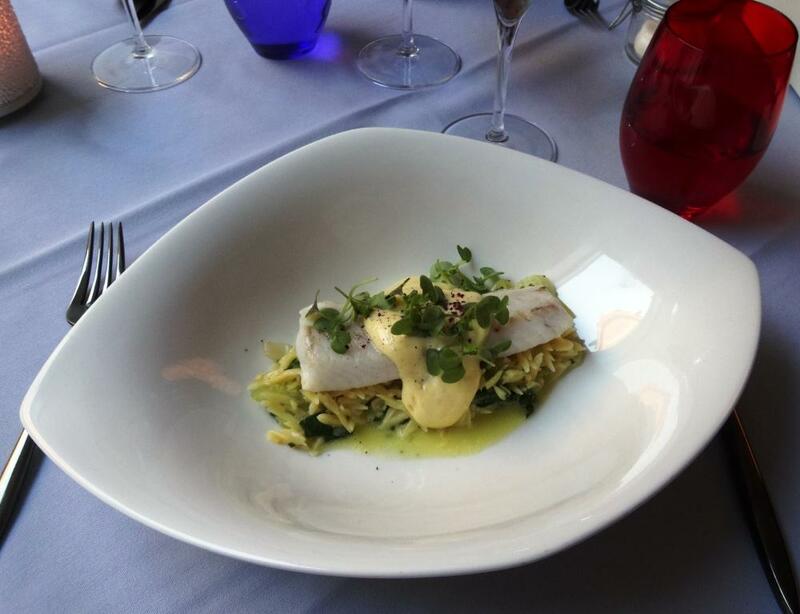 Food at Ragu is well prepared, elegantly set and delicious. Finnish-Italian fusion cuisine works well by combining best parts of both. If fish main course would not have been so salty, Ragu would have earned close to 5 points for food. Waitresses take orders and serve drinks but you can meet chef’s, bakers and confectioners as they bring most of the portions to the tables. The contents of each portion was explained well and it is needed, if you choose surprise menu as we did. 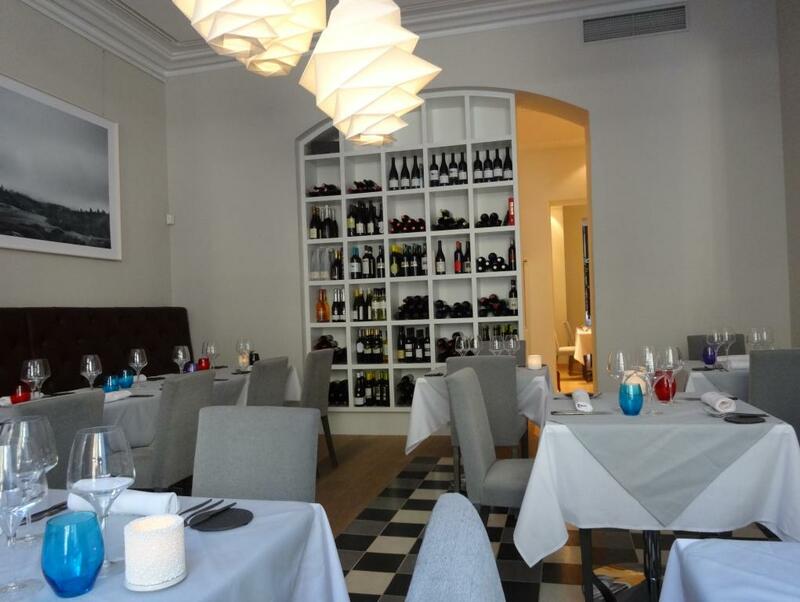 Our revisit was successfull and can thefore recommend Ragu, if you are looking for sophisticated and modern dinner setting with excellent food. 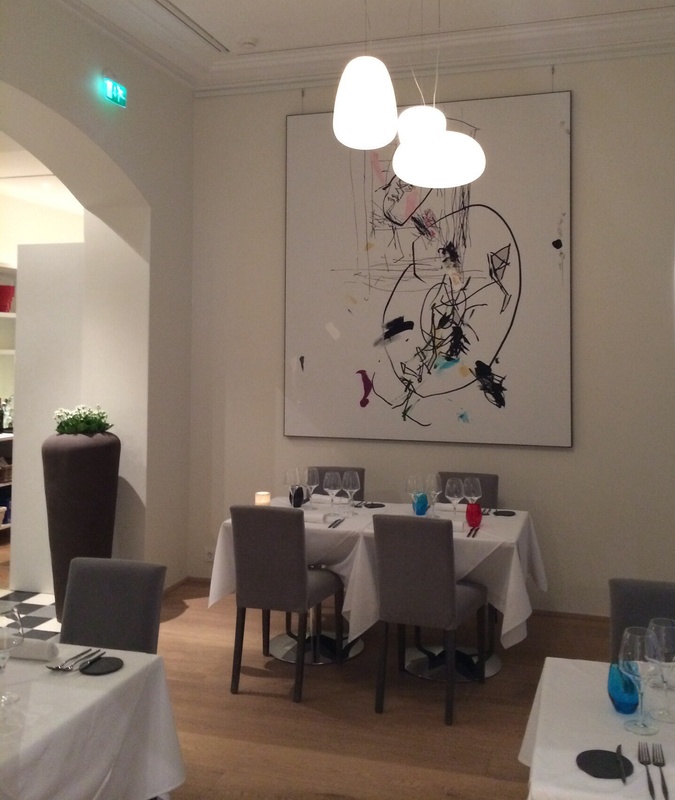 Restaurant Ragu opened its doors April 15, 2014, respecting the history of renovated Neo-Renaissance house in the 1890s. Restaurant has dining rooms and all year-round open terrace. Chefs Antti Antti Asujamaa and Erno Kemi have created a menu from Italian food traditions and Scandinavian ingredients. One possibility to get familiar with Ragu is to visit the bar where you can step in from the restaurant or from separate door outside. 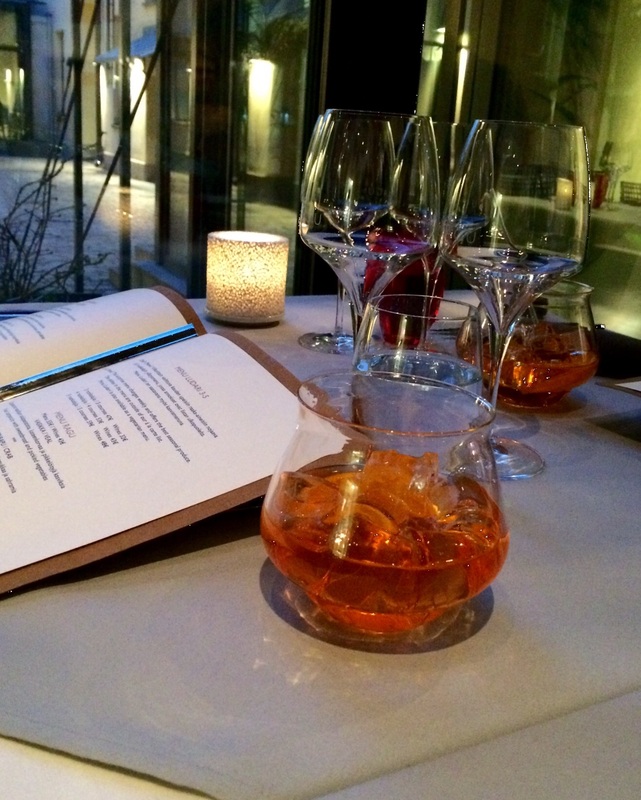 Started the dinner with Aperol Spritz aperitives which were served in fancy drinking bowls. Drinks were so far the best we have tasted in Helsinki, because the amount of Aperol was just the right, so that you can identify the flavor. Unfortunately too much soda or ice have ruined many of the other experimentations with this drink, but not this one. You can choose separate portions from a la carte list or pick for instance one of the menus. We chose menu Ludari with 4 courses which partly were surprises. The name of the menu comes from the street restaurant is located, Ludviginkatu, I believe. Kitchen was skilled to take into account customers constraints of some food ingredients and other wishes also with this menu. Menu should change on weekly basis. After placing the order freshly baked 4 different breads and 4 different spreads were brought to the table. Yeast bread with red tapenade was best combination. Wish I could prepare as delicious tapenade as Ragu kitchen can. 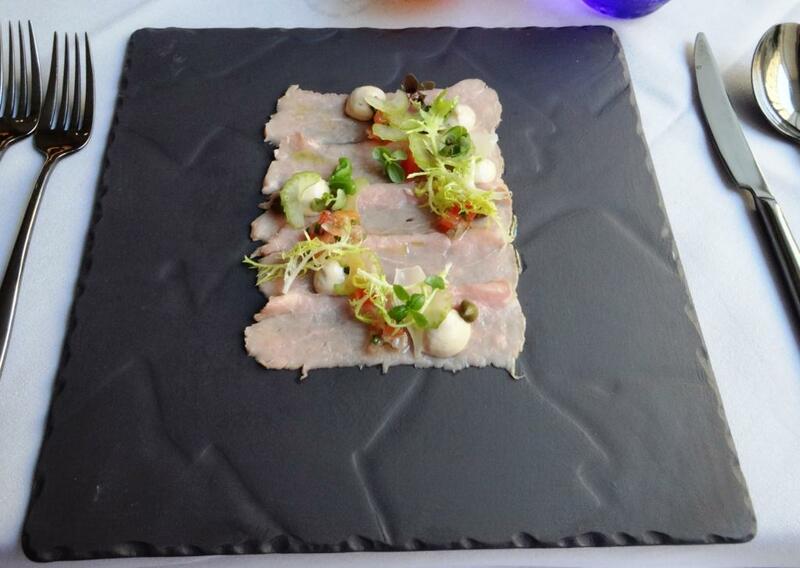 Vitello tonnato is classic Italian starter. Ragu had modified it so that veal was like carpaccio, raw, but softened in marinade. Salty capers and almost sweet tunafish sauce complemented each other. Whitefish is one of the best fishes and it is not dependent how it is prepared. But of course kitchen has to know how to cook it. 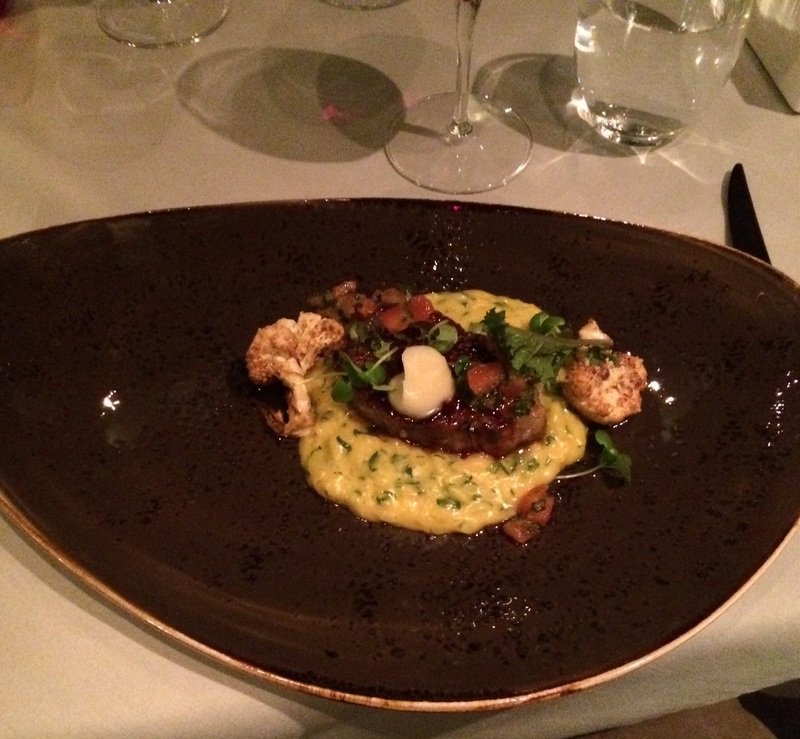 Shrimps complemented perfeclty the taste of salty roe and some vegetables lightened ensemble. 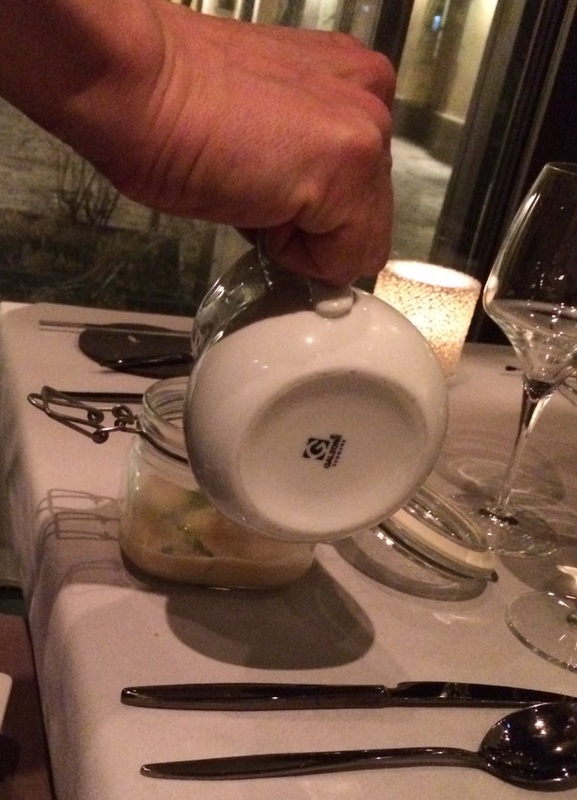 Second course was Toast Skagen with crab soup. Can not say much more that portion was really mouth-watering. Classic toast skagen was on the bottom of the plate but it was supplemented by crab soup which was poured at the table on top of toast skagen by waitress. Best portion of all four portions eaten at Ragu! For 3rd and main courses restaurant served Whitefish with pasta and Braised veal with polenta. The pasta served with fish was orzo or risotti, not anymore sure which one although waitress said the name. Anyone knows? It is unsual to serve pasta with whitefish in Finland but at Ragu it is not due to influences of Italian kitchen. Fish and pasta paired extremely well; desired only some herbs to bring more flavor. 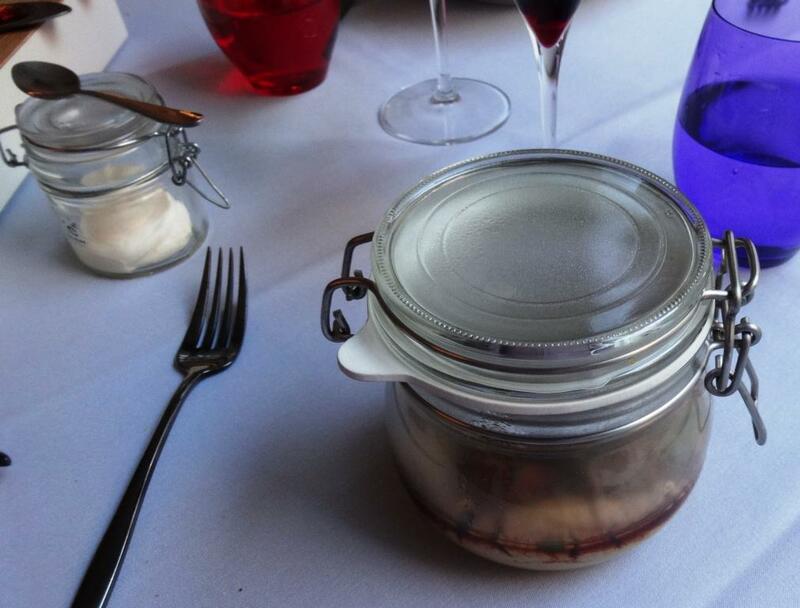 Veal was served in closed glass jar which kept the portion warm. Also creme fraiche, which you sprinkled on meat pieces, was in in smaller jar. Meat was soft as it should be. The amount of salt in meat could have been more because polenta was also modestly salted. 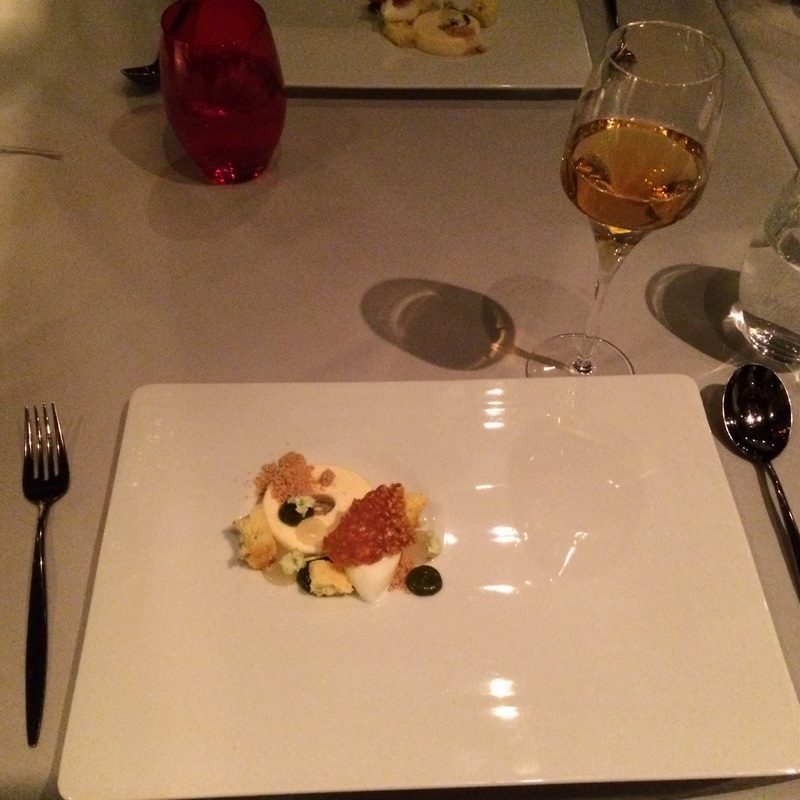 Splendidly prepared portion, tour de force from the chef’s. And for desserts we got two different portions. 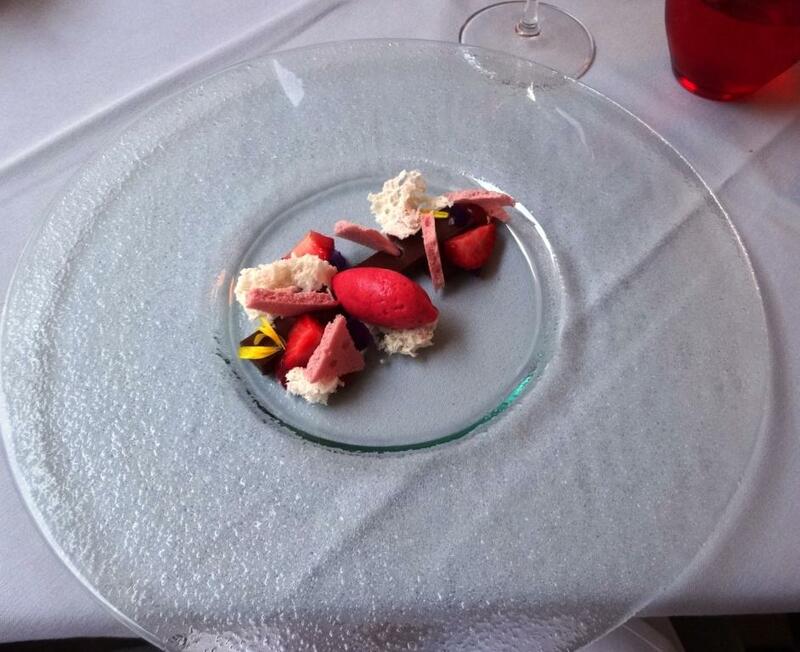 Both included sorbet, almond cake and fresh berries. The difference was that one of the two portions did not include any milk products. Strawberry ice-cream made the difference in first portion and Dark soft chocolade in another. 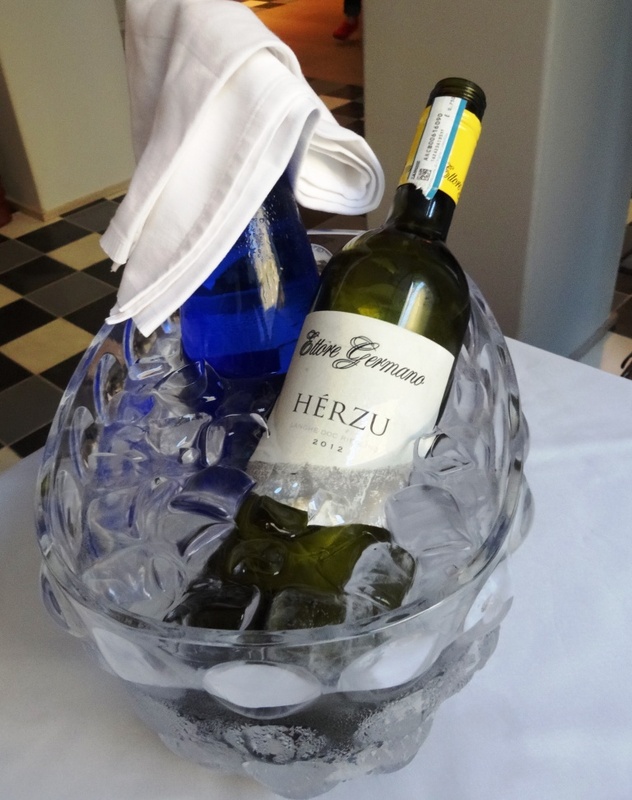 For wine we chose Ettore Germano, Hérzu Langhe Riesling 2012 from Piemonte, Italy. Riesling Renano is the winemaker Sergio Germano‘s favorite grape. Otherwise riesling is not so common in Italian wines. Dry, fruity and balanced wine. Not so much minerals or petrol as in most Austrian or German rieslings. Restaurant, as it is in elegantly renovated building and it’s dining rooms are classic yet chic designed, is welcomed newcomer. You can eat in privacy as tables are not too close to each other. Music is not too loud, again more customer-centric approach. 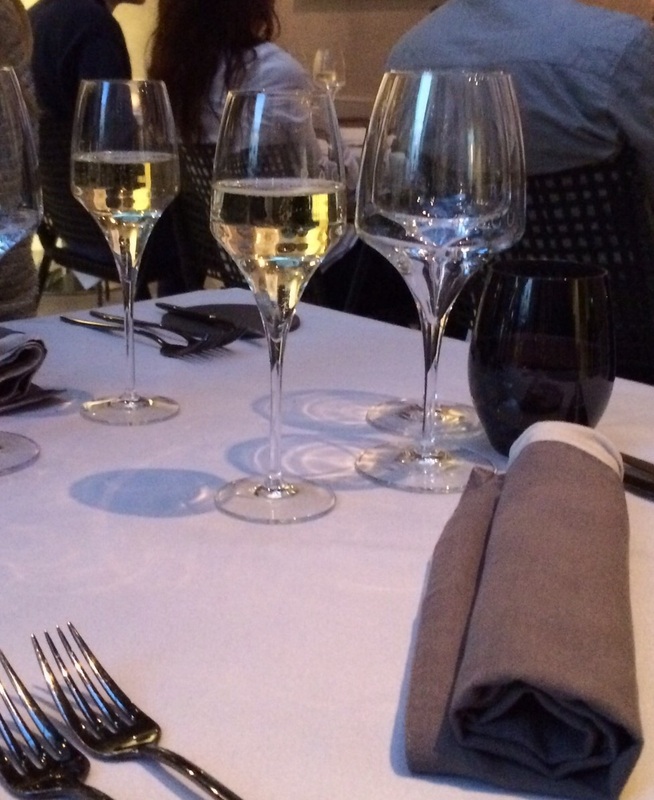 As you can see from the glasses on the tables, every detail has been taken into account. At 8PM restaurant was almost full booked which tells that Helsinki townies have found the place. Did not hear any foreign languages, though. 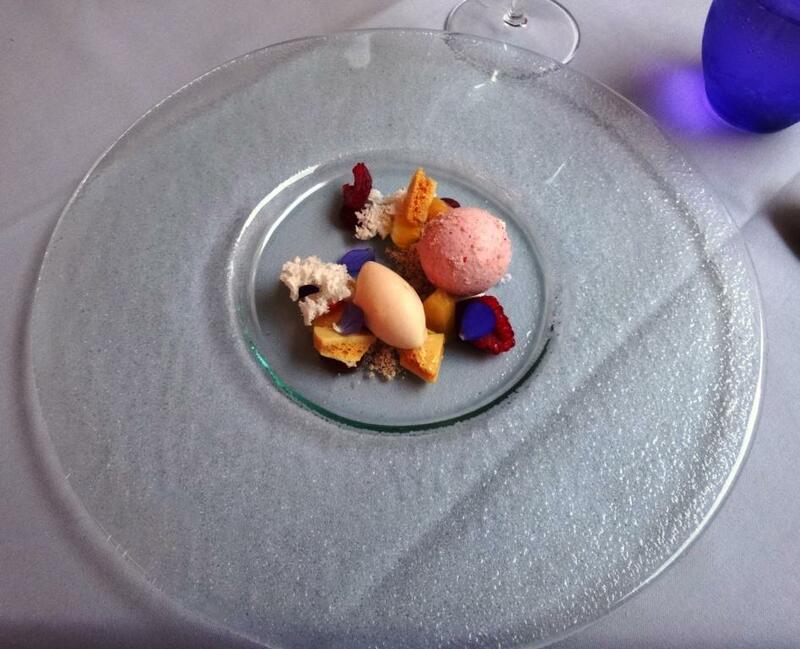 Food at Ragu is well prepared, elegantly set and delicious. Finnish-Italian fusion cuisine works well by combining best parts of both. Only if there had been more depth of flavors in main courses grade for food would have been close to maximum. Waitresses take orders and serve drinks but you can meet chef’s and confectiners as they bring most of the portions to the tables. The contents of each portion was explained well and it is needed, if you choose surprise menu as we did.